It was on Saturday May 24 at around 5:30 p.m.. Because I arrived in the zoo at 9:00 a.m. and had been walking around from one place to another, I barely felt my feet. And furthermore, it was pretty hot that day. So, I was wondering whether I would go back to my hotel, take a shower and find me a restaurant close by to eat something. But then I decided that maybe it was still a bit too early to leave this lovely zoo and so, I went back to Knut’s enclosure. Needless to say that there were many people standing around him. Considering that I am small (only 1:60m) and do not see well (and stubborn enough to wear glasses), I knew that this was going to end up in a disaster. Then I heard a lot of splashing in the water and people saying “aah’s” and “ooh’s”. Immediately, I realized that Knut must be in the water, but wherever I went I could not find him. So, finally, I gave up to find me a good spot and just absorbed the atmosphere. Next to me stood an elderly woman, who must have noticed my problem. 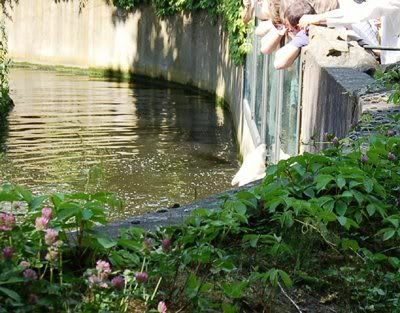 So, she showed where exactly Knut was in the water. Well, it worked more or less. And then, we started to talk in German(Au weia, that is more or less an euphemism – Bea – sakkerdepitjes, stop laughing). She asked me whether I was also living in Berlin. And no, I am living in Leuven, Belgium and came to see Knut. “Ah, this is your first time?” “Well, no, actually, my third time”. Her lovely spontaneous reaction: “Na gut, then you are from now on also a bit a Berliner”. And so we continued talking about Knut’s feeding, our annual ticket, her visits to the zoo (OK, I admit that sometimes there came a glaze in her eyes and that I had to rephrase the words in a more or less better German way). And so, we landed on the item of Knut’s stamp. And yes, I heard about that and that I regretted for not having one. And you know what happened then. This adorable dear lady simply said: “oh what a pity, you do not have one, well, wait, you need to have one”. She opened the “etui” in which she was keeping her annual ticket and said: “here, I have a spare one, you may have this one”. Well, my dears, it s not easy to astonish me, but at that moment, there were no words, not in my mouth, nor soul, but my heart was singing. I was having a “Knut Briefmarke”. From now on, this is a treasure for me as you will understand. 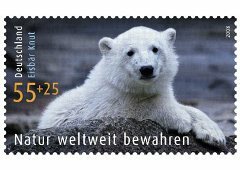 Can you believe this, the love and admiration for Knut in the form of a stamp was given to a complete stranger? This lady did and does not even know my name. On Sunday, I discovered that the zoo is selling these stamps, but, receiving it this way is the same as giving me the sun the moon and the stars. I hope that when I am back next week, I meet her again. Now I regret for not having asked whether I was allowed to take a picture of her. I have printed some of my Knut pictures for her and would like to give them. And so, I must ask you all a favour. Since I only know her first name (“Frau Renate”), may I ask to light a candle, to say whatever prayer or to send your thoughts to her so that we could meet.